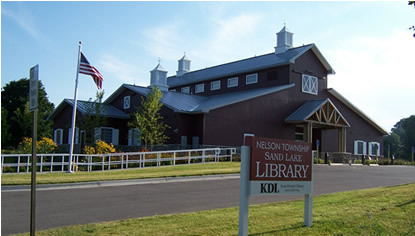 The formerly tiny Nelson Township/Village of Sand Lake Branch of Kent District Library has served this community well since the early 1900’s. Previously maintained by funds from the Village and Township, operating costs in the 1980’s became out-of-reach for contributions from the general funds. The library is now maintained by a township-wide (which includes Sand Lake) millage that was voter approved in 1987. As a member of Kent District Library (KDL) this municipality provides the facility and furnishings to house the library. KDL, operating on a county wide-millage, provides the quality resources, technology and staff necessary to meet the needs of the growing community. The Library now has a beautiful new facility located at 88 Eighth Street, two blocks west of the Village/Township Hall. The groundbreaking ceremony has held on September 8th, 2006. The dedication was Held on Saturday, May 19, 2007. The facility was built and will be maintained by Nelson Township. As of May 31, 2016 the mortgage was paid in full! Many thanks to the donors, friends group, community support and the Township for making this happen. See www.kdl.org for local programming and other information. We welcome you to join our Friends organization and help by raising funds for unbudgeted items, provide volunteer help, help with programs and public relations and advocate for the library. For more information call the library at 636-4251 or contact any Friend.